Paris, 1797, the streets are still stained red from the handiwork of Madame Guillotine. In the area known as Batingnolles, a small group of men and women step nervously through a graveyard. They quietly enter the cloisters of the Convent of the Capucines, pass through an ancient door, down into the crypt. Inside the sombre place, weakly illuminated by a sepulchral lamp, others are already waiting seated on the tombs. The atmosphere is intense, all faces are grave, people speak in lowered voices. A pale gaunt man enters and addresses them. "The experiment which you are about to see must interest philosophy. The two great epochs of man are his entry into life and his departure from it. All that happens can be considered as being placed between two black and impenetrable veils which conceal these two epochs, and which no-one has yet raised". He looks round solemnly "But the most mournful silence reigns on the other side of this funerary crepe: and it is to fill this silence, which says so many things to the imagination, that magicians, sibyls and the priests of Memphis employ the illusions of an unknown art, of which I am going to try to demonstrate some methods under your eyes". I have promised that I will raise the dead, and I will raise them". There is the sound of rain, of thunder, a funeral bell tolls, calling the shades from their tombs and a strange music, sweet and penetrating. Lightning furrows the vault in every direction, in the distance, seemingly beyond the confines of the crypt, a figure appears. It is the Grim Reaper, Death himself, scythe in one hand, the sands of time in the other. Death slowly approaches, closer and closer, A woman screams and Death disappears suddenly into the darkness. Other hideous spectres appear and disappear. The ghost of Robespierre attempts to rise from his tomb, lightning strikes, turning both ghost and tomb to dust. Diogenes, lamp in hand and other famous people from the other side of the Styx, show themselves. The three graces appear in all their beauty, but their flesh withers leaving three skeletons in their place. The head of the Gorgon, Medusa, fills the room. Demons and ghost dance around the walls. Smoke seeps from a coffin in the centre of the crypt, materialising into the form of a young woman, then is blown away. Supernatural spectacles follow one after another, at last Robertson speaks once more. "I have gone through all the phenomena of the phantasmogria. I have unveiled the secrets of the priests of Memphis, showed you what is occult in physics; but it remains for me to offer you one, which is only too real. Those of you who have perhaps smiled at my experiments, beauties who have experienced a few moments of fear, here is the only truly terrible spectacle, the one wholly to be feared: Strong men, frail men, monarchs and subjects, believers and atheists, beautiful and ugly, here is the lot which awaits you, this is what you will be one day. Remember the Phantasmagoria." The light reappears and in the middle of the vault the skeleton of a young woman stands on a pedestal. The Phantasmagoria of Etienne Gaspard Robertson, was the sensation of post-revolutionary Paris. His multimedia Gothic horror show thrilled his audiences, his theatre an ancient chapel was dressed up and decorated to great effect, in the same way that theme parks do today, getting people to participate before the show had even started. Other showmen started to produce Phantasmagoria shows in England and America. There is some evidence that Paul de Philipsthal who presented a show at London's Lyceum theatre in 1801, may have originated the form. However no-one it seems before or after has presented such a show with such panache. Robertson used a number of magic lanterns to produce his various effects. Some were used to back project on to a large screen, thus keeping the lantern hidden from the audience, these large lanterns were known as Fantascopes and ran backwards and forwards on wheels; a device attached by pulleys to the wheels kept the lens focused. 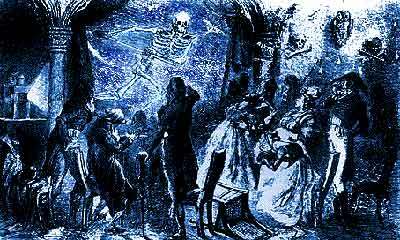 Assitants placed among the audience had small lanterns strapped to their chests, which allowed "spectres" to be projected in unusual places. Other effects were produced by projecting on to smoke and the use of a Megascope to project models and puppets. Robertsons Tomb is in Pere la Chaise cemetery in Paris.